The limited edition set is tied using a double crown knot in 6mm hardy hemp line, with the four ends seized with constrictor knots. The books ship with instructions describing how to retie this knot. You can see it being tied in this 30 second movie. It’s fiddly to do if you only have two handfuls of five fingers apiece, but of course it can be done if you follow the instructions carefully. It’s a little bit easier if you have a pair of friend’s hands to help you. 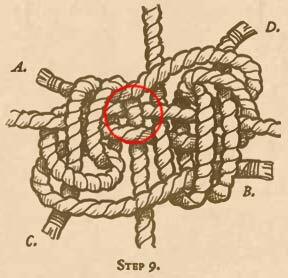 There are several inconsistencies in the lay of the rope in the knot illustrations. The lay of a rope is the way its component strands wind around themselves. When rope such as traditional 3-strand rope is manufactured, it has either right- or left-hand lay, which corresponds to a clockwise or anticlockwise winding along its length. A piece of rope therefore has the same lay along its entire length, and an illustration that shows anything different is plainly wrong. You can see this error in the PDF above (if you know what you’re looking for): the rope switches, from one step to the next, between different lays. If you look carefully at the illustration of the knot in the front matter of Water you can see that one end of it is right-hand lay, and the other is left-hand lay. An impossible piece of rope, and not something that even the Knot-Shop Man could produce! The little illustration of Jill in the Earth book shows her wrists unadorned. But if you’ve been following the text you know that she should have the bracelet on her wrist that Mister Overhand tied on for her. Similarly it’s hard to believe that Jack’s illustration is quite right in Water. If he’s about to go into Arxnodorum, then his kerchief would no longer be around his neck, as drawn, but tied like a tourniquet around his arm . . .